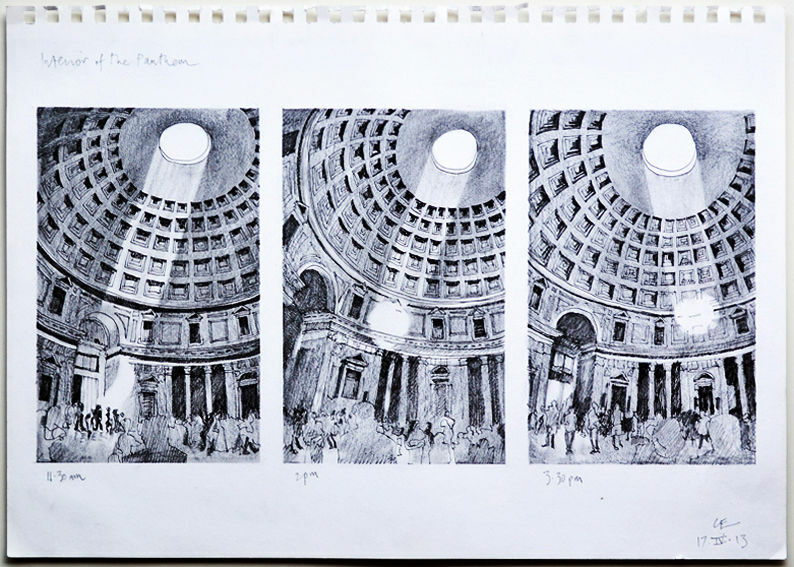 In April 2013 I spent a day in Rome having a good look at the Pantheon. I’m embarrassed to admit that this was my first visit to what must surely be one of the most remarkable buildings ever constructed. I'd seen Piranesi's drawings, why hadn't I gone there years ago? And how the Pantheon has survived from Roman times seems miraculous. The coffered dome is a hemisphere. Unbelievably, the rotunda which the dome sits on is exactly the same height as the dome - therefore if the dome is visualised as a full sphere it would just touch the floor of the building. The dome is made from poured concrete, very artfully strengthened with progressively lighter reinforcement as it gets higher and thinner. It always saddens me that concrete (and by association modernist buildings of the 1960s) is condemned in the popular press; in the right hands it's a most beautiful material. Apart from the entrance doors there is only one source of light - the oculus at the centre of the dome. And yet the interior seems bathed in light. It’s very much like being in a James Turrell Skyspace sculpture; the changing sky viewed through an opening. But after being inside the building for an hour or so I realised there’s another quite amazing effect : the sun enters the building like a spotlight, and as the earth moves the beam of light moves across the face of the interior. My drawing attempts to show this; three little sketches made at 11.30am, 2pm, and at 3.30. This drawing was awarded the Hicks Purchase Prize at the Discerning Eye Exhibition 2013.